This boxlike Unversed launches fireballs at its enemies. Destroy them before they destroy you! Don't get hit, or you'll lose precious seconds. Shotlocks or wide-range magic attacks are your friend! The Flame Box is an Unversed found in Kingdom Hearts Birth by Sleep Final Mix. The protagonists can battle it for a Firaga Deck Command. 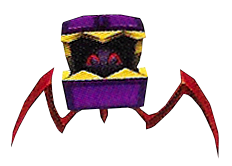 A Flame Box is a purple, treasure chest-shaped Unversed. It is a palette swap of the Spiderchest. It has yellow "teeth" lining the lid of the chest and three orange, zig-zagging, bladed legs. The Unversed's spherical, black head is protected inside the chest. Its red eyes are set in a happy expression and the Unversed symbol adorns the top of the chest's lid. The Flame Box's name references its resemblance to a treasure chest, its ability to launch fireballs, and the Firaga Deck Command that it drops. The Unversed Mission for the Flame Box can be found in the Waterside area of the Enchanted Dominion. In this mission, the player must destroy meteors launched by the Flame Box. If the player destroys 30 or more meteors without them touching the ground, the player will be awarded three stars for the mission. In the early stages, only a few fireballs are launched at a time. These can be dispatched with simple Keyblade strikes or Surge-based Commands. The meteors will deal damage to the player if they get too close, so it is recommend to have one or two Cure Commands in the Command Deck. Later on, many fireballs are released at once. The most effective strategy would be to use Magnet or Zero Gravity commands. The wide-area effect of these spells means they destroy multiple meteors at once, and Magnet commands continue to destroy any nearby meteors as long as the spell is in effect.